After spending just over a week in Bangkok, we made a little excursion yesterday to a place 136km away called Kanchanaburi (or Kanburi, or even Kan to the locals). This is a place that hasn't always seen the happiest of times. Even in the last month, it's been getting some bad press. A couple of British tourists were killed here a month ago by an off-duty police officer. I've not been following the case too avidly, but as I understand things it followed a heated argument with the police officer at a restaurant and ended up with the man being shot and his girlfriend then being run over. The police officer then went on the run and only turned himself in a couple of days ago. It may have put some people off travelling to 'Kan' but as I saw it, it was not like there was a serial killer on the loose (well, he was on the loose, but everyone knew who he was and he was in hiding ... anyway), or some terrorist threat to westerners in the area. I did, however, make a mental note to be extra polite to any police officer that might stop me for any reason. It does happen, too - the other day we were pulled over in our taxi at a roadblock for some random passport/visa checks (it is a legal requirement to carry your passport with you in Thailand). 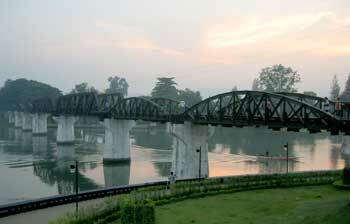 Kanchanaburi is best known for one of its bridges. It spans the River Kwai. Yes, you know which bridge I'm talking about and today, after a day of relaxing in a cool hotel room, we headed out to see the bridge for ourselves. The Bridge on the River Kwai, also known as the 'Death Railway Bridge', is famous not because of any aesthetic beauty - not surprising, really, because it could never be described as 'eye candy' - but because of its construction. During the Second World War, the Japanese army used prisoners of war to construct a railway linking Thailand with Burma, and it's estimated that it claimed the lives of 16,000 prisoners. That figure alone is bad enough, but including labourers from Thailand, Malaysia, Indonesia and Burma, the deaths go up to between 90 to 100,000. It's easy to understand why this was dubbed the 'Death Railway', and the River Kwai Bridge was just a small section of this tainted railway. As we walked down the railway bridge, I couldn't help but think of the absurdity of some of the sights in front of me, namely the karaoke rafts going up and down the river below us, the café playing C&C Music Factory loudly near the eastern approach of the bridge and countless people having group photos taken in front of the bridge, smiles plastered on their faces. It all seemed so at odds with the railway's original purpose, and I thought to myself how on earth could anyone who slaved away building the bridge even consider that one day it might be a focal point for the local pleasure barges, a weekend retreat for Thai teenagers who want to sing their hearts out to their favourite pop songs. As I walked along the span of the bridge, taking care not to put my foot in one of the many large gaps in the structure, I wondered just how much of what I was looking at was 'original'. Apparently, not much of it - the rails were torn up after the war and used to make rudimentary sun shelters in other stations throughout the country, and given that the bridge was bombed by the allies twice during the war, it's difficult to know what can be classed as 'original'.